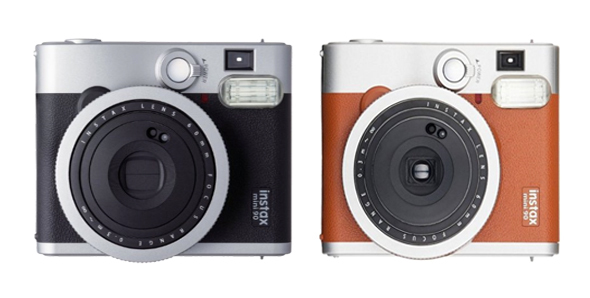 I’ve had an Instax mini Polaroid-style camera for years now and I’ve loved that instant gratification that comes from having a physical printed-out photo! There’s something magical about those 30 seconds when the film is developing before your eyes. We’ve been building up our collection again, more slowly this time. Turns out photos are way more fun to take with New York as the backdrop! Who knew? :) It really is such a fun little camera though. It comes in handy all the time. We actually used it a ton at Heather’s wedding reception! I bought a hand bound paper album on Etsy and let the guest take photos if they wanted while they were signing the guest book in the receiving line. By the end of the night Heather and Stephen had a huge scrapbook of photos and notes from friends and family that they keep on their coffee table at home now. For our own family photos, I have been reluctant to put the polaroids in another album. I have mild PTSD about losing all of them, but I also wanted to be able to see the photos more often so I framed a few for the walls of our new guest bathroom. 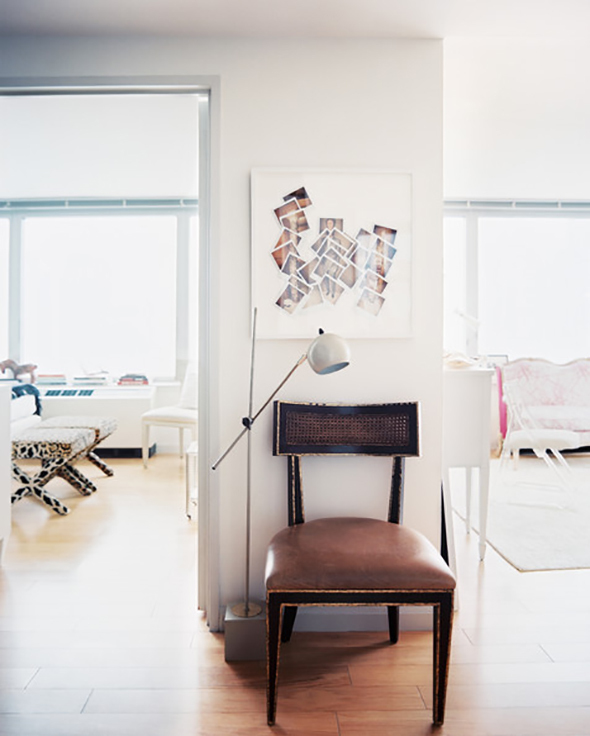 I was inspired by Rita Konig’s apartment and this Instagrammer’s home. I picked up a couple of simple white frames from Target but I wanted the polaroids to be mounted on a linen board instead of just paper. I think the textural background adds so much! 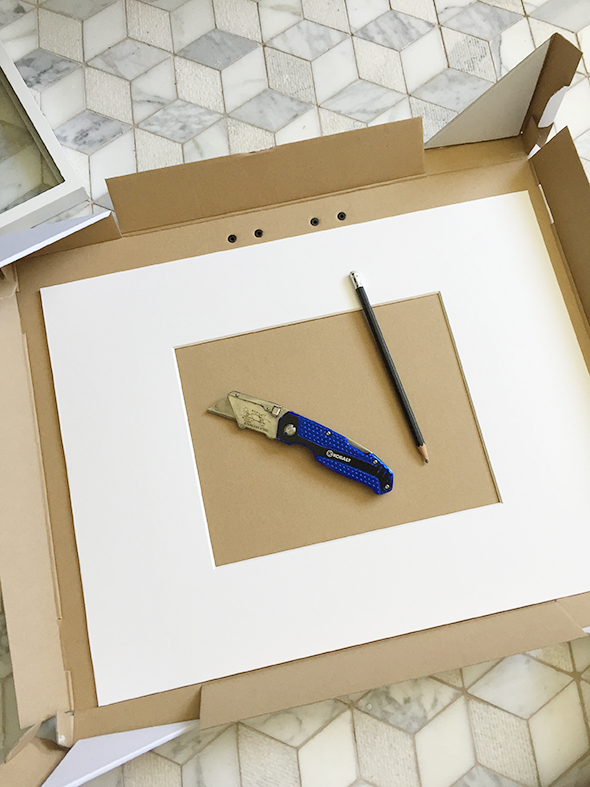 I used the provided mat as a template to cut out a piece of cardboard to fit perfectly inside the frame. I reused the cardboard packaging that came with the frame, but you can use any box you have handy. 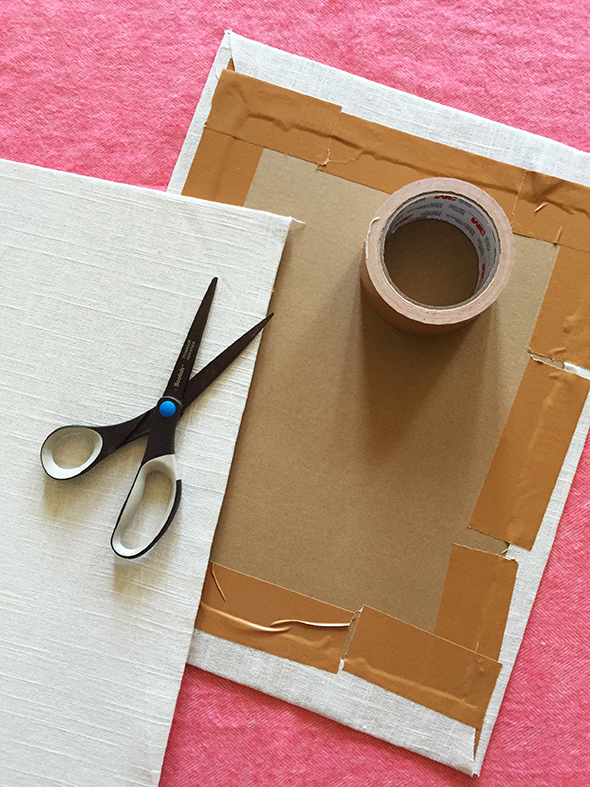 Then I cut some white linen fabric a few inches wider than the cardboard, notched out the corners and folded and taped the fabric down on the backside of the cardboard. You want the fabric to be as tight and wrinkle-free as possible. You might even want to iron the linen before starting to help out the process, though the wrinkles will release over time. 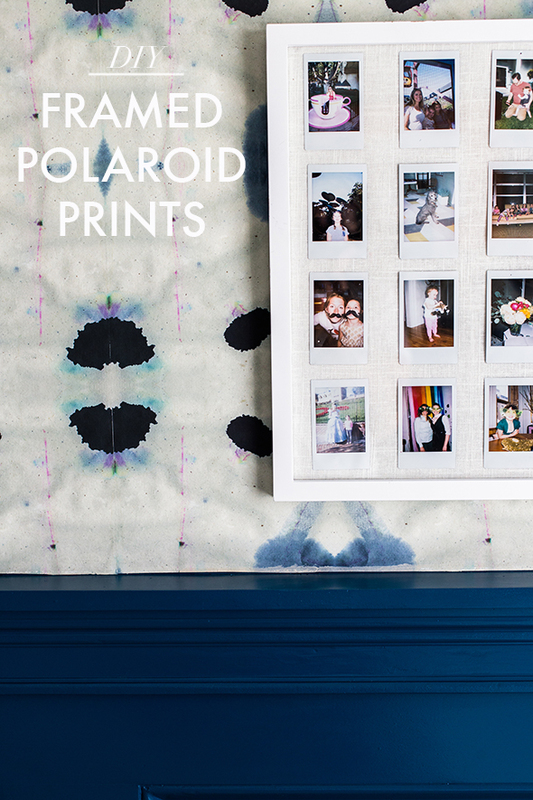 You can lay out your polaroids in a grid pattern like I did, or you could do something a little more loose and artistic, like this piece in Michelle Adam’s old apartment. 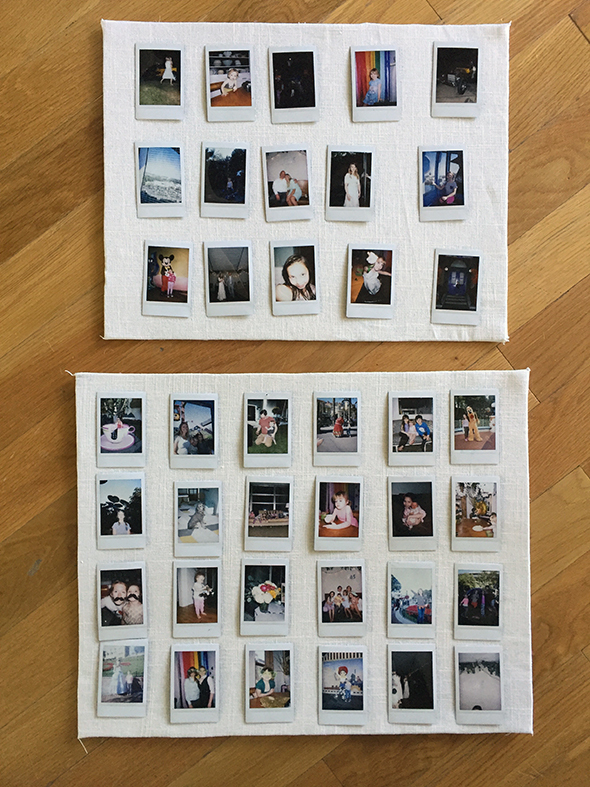 I used this removable double-sided tape to mount the polaroids on the linen board. That way I can still put the photos in an album down the road at some point if I feel like switching things up. We already have about 30 more photos now from our vacations this summer so that switch up might happen sooner than later! 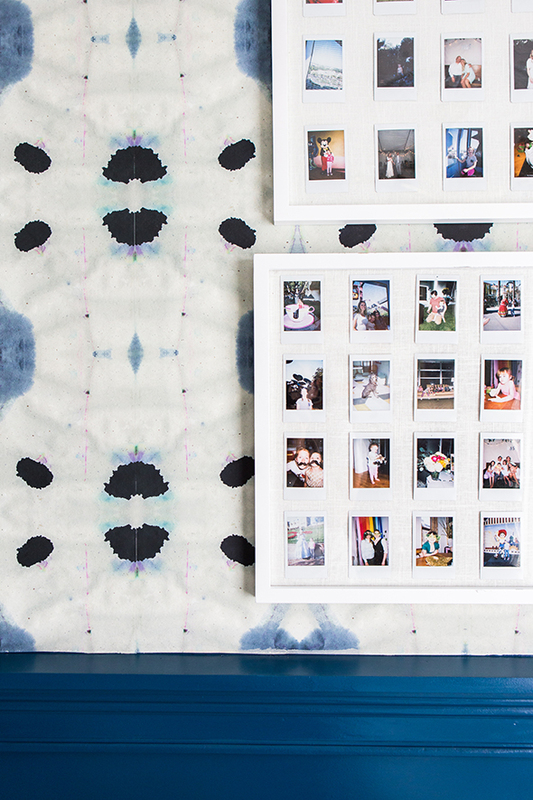 What’s your favorite creative way to display family photos? Great idea. We need to use this for our projects. Does tossing our Chatbooks onto the coffee table count as display? Hope so . Hi Jenny – I’m wondering why you don’t show us a full picture of the frames? I’d like to see how they look in the context of the bathroom. It’s a neat idea but I feel like I didn’t get to see the final product. Thanks! What style or type of frame did you use from Target? I would like to purchase the same. I have lots of polaroids that need a great home like this. Cool idea! Also, I know you’re busy, but are there posts coming soon about the wedding reception you held in your home???? About to get married soon and starting on some crafts and ideas, so I would love to see how beautiful the wedding turned out! Thanks! Hello!! Who makes that amazing blue wallpaper!? 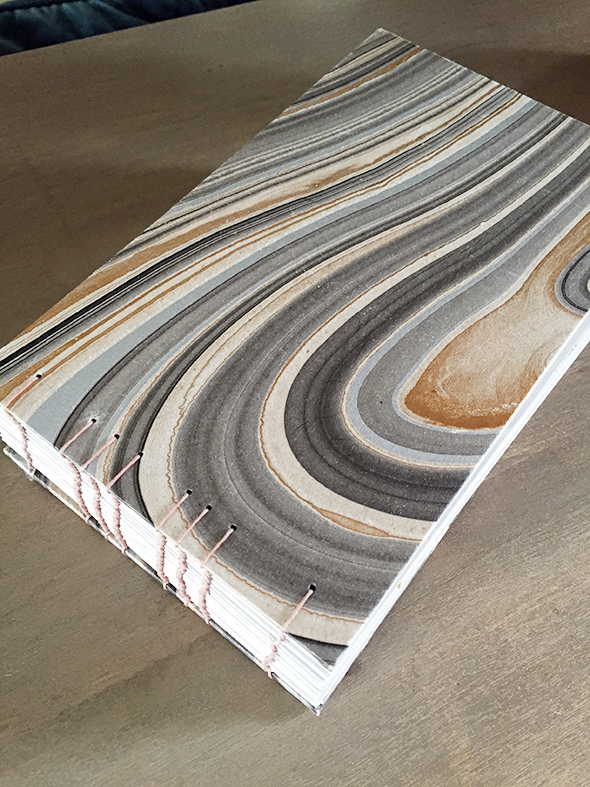 Could you tell us the source of the etsy store for the guest book? I would love to order one for a friend! Hi!! Great idea and love it!! Fabulous idea and execution. Quiet in contrast to Custom Wallpaper with image collages that we hang as Kids Room Wallpaper. Loved your work. Will use this idea in my home. I adore the frames on the sabori wall, so simple and cool. 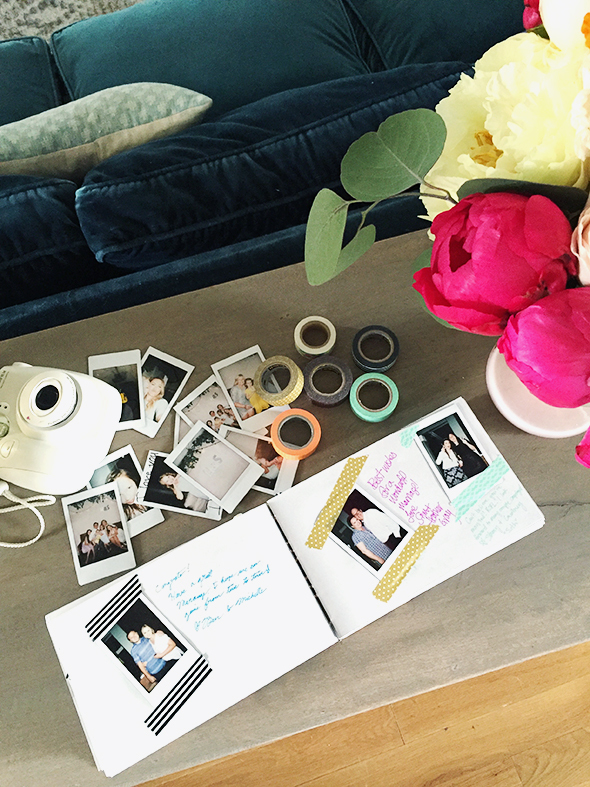 I am also toying with the idea of getting a scrapbook that we can keep on the coffee table and fill with memories! I got teary -eyed when I read that you had accidentally thrown away some of your photos. I know exactly how you feel. I sold a console table at a garage sale shortly after we moved to a new home and all my son’s pee wee football pictures were stored on one of the drawers. Once I realized what had happened I tracked the woman down who had bought it and she had thrown them away! Who would do that? My son is a senior this year and I would so love to have some of those pee wee pics alongside his big boy football pics! 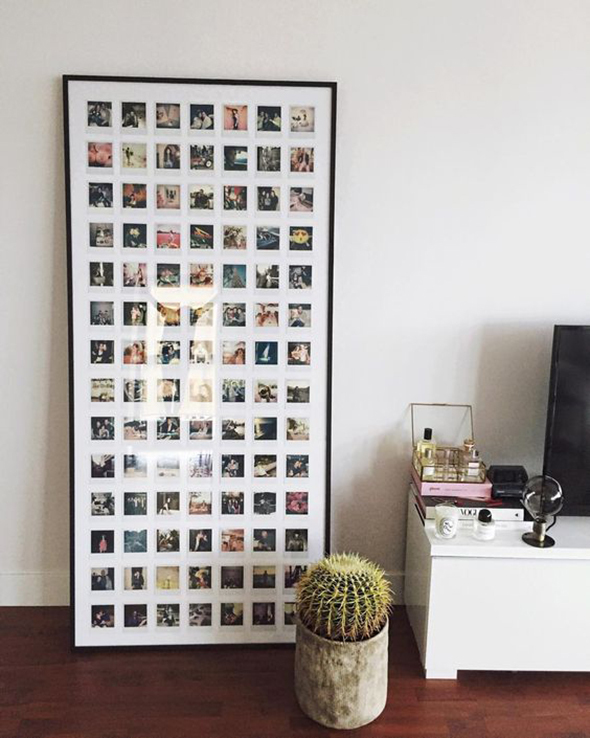 Beautiful way to display your photos by the way! I need to do this with the instax guest photos taken at our wedding reception!! I will do this for sure. Thank you for sharing with us. 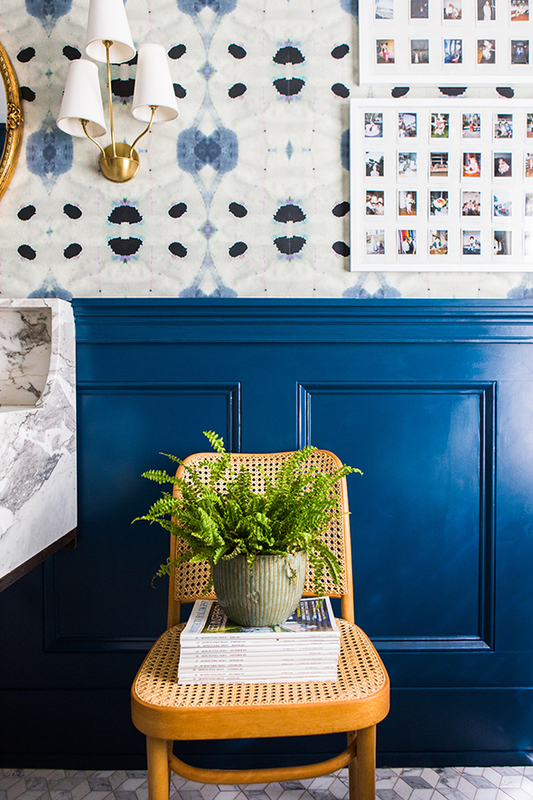 This is an awesome tip….but the blue of that wall is what I’m in love with. Any chance you can tell me which paint and the colour? So glad I found the site, picked you up on Pinterest now too! I have a gigantic National Geographic world map I want to display on a wall (it is truly gigantic) and need to put like some backing on it… Thinking styrofoam esque? Any ideas what I should use? Nice idea! I also like throwing some photos in a tray or bowl on the coffee table so they can be easily accessed and flipped through. 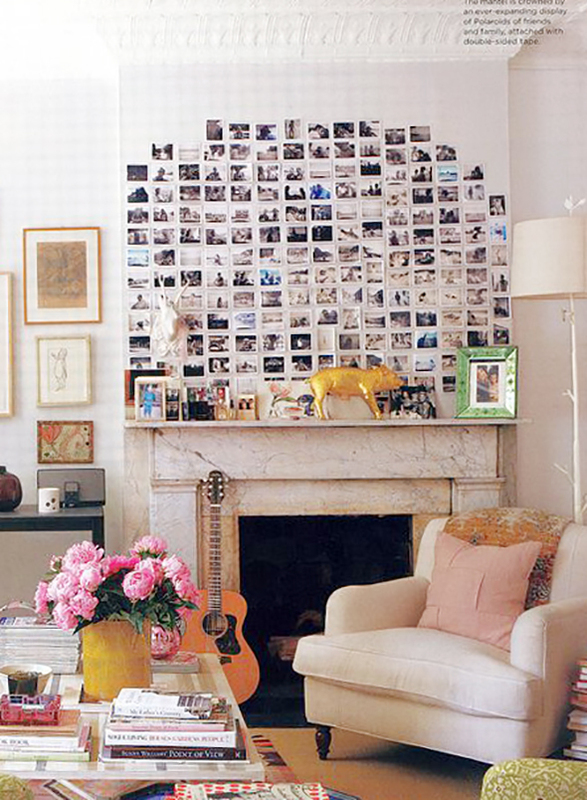 Another thing I have done is displayed photos in a similar grid pattern, with polkadot washi tape directly on the wall. This makes it easy to change the display according to your mood or aesthetic. Nice Ideas. 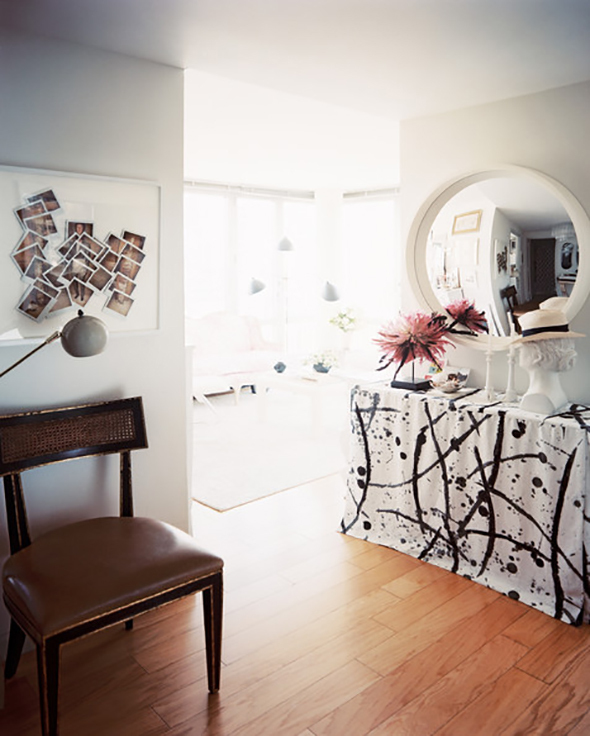 Frame Posters & Wallpaper is also another alternative that one can try. These could be personal memories in kids room or family rooms. The larger frame that is sitting on the floor with the photos is wonderful! I agree with Sam, it is wonderful! As always- your vision and execution is perfection! I have yet to see, after years of my super sleuthing top secret stalking of your blog, anything I wouldn’t happily move into. I sold a console table at a garage sale shortly after we moved to a new home and all my son’s pee wee football pictures were stored on one of the drawers. I really love your collection, that’s really easy and cool. I also make crafts and purchase DIY supplies online from wholesale ribbon shops, they offer good collection at cheap price. If you need craft material at wholesale price then you must try once. Thanks for sharing your lovely creation. Fabulous idea and execution and love it!! Lovely collection and great creativity.